Since Motherwell won at Pittodrie on Boxing Day the Dons have beaten Ross County , Dundee United, Kilmarnock and Hibs before losing to Inverness last week. They have replaced United as the current media darlings with many praising McInness and his squad. At the same time we have just ended our six game winning run and lurk one point behind them with a game in hand. Aberdeen have enjoyed two wins in Motherwell this season. At our first home game of the season, despite Anier opening the scoring after a minute, we lost 3-1. We also suffered a bad loss in the League Cup when we couldn’t beat their ten men. Payback came in December when Ainsworth’s strike snatched a victory at their patch. The visitors are likely to be mindful that they have a semi final the following week and it may be that some changes will be made. Aberdeen are talking to Adam Rooney** about a possible return to Scotland after he failed to find success in Oldham. It might be that the deal is done in time for Saturday’s game. There will be little room for manoeuvre in Stuart McCall’s planning for the game. Ramsden is still recovering from his knee procedure so we won’t have our normal back four in action. At Parkhead last week Hammell switched wings and Francis-Angol started at left back. If Kerr is fit it’s likely that he’ll come in to the right back slot and allow Hammell to resume his normal role. The choice up front is between McFadden and Anier as a partner for Sutton. The Estonian has not started a game since becoming a Motherwell signing and Faddy is regaining form. We’ll know when the team lines are revealed. The outcome is far from predictable but a share of the points would probably satisfy both managers. A 1-1 would not be a surprise. 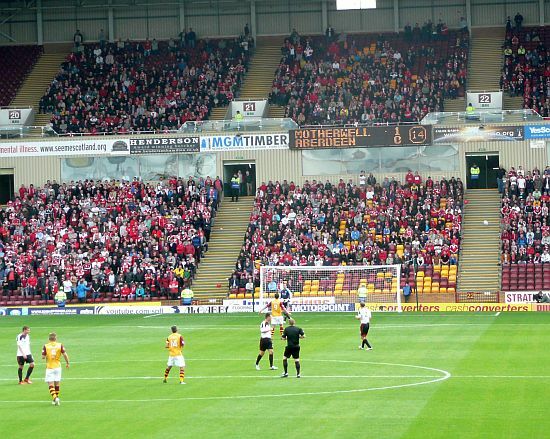 Remember the last time Aberdeen were at Fir Park? ** Rooney signed on Thursday & goes into their squad for the game.